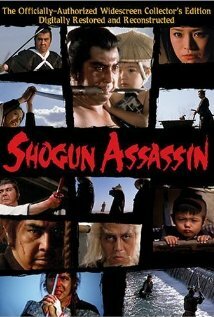 Buy or Rent Shogun Assassin (1980) Movie DVD & BluRay Online! Movie Plot: Long ago there was a great samurai warrior who served his Shogun honorably. The Shogun however grew paranoid as he became more and more senile. The Shogun sought to destroy all those who might stand to oppose his rule, and so he sent his ninja spies to the samurai’s home. The ninjas failed to kill the samurai, but did kill his beloved wife. From then on, the samurai swore on his honor to seek out the Shogun and avenge the death of his love. The samurai roams the countryside with his toddler son taking on mercenary work for money until the final battle with the Shogun’s three Masters of Death.